Taylor's Sweet Little Art and Nerd Site: Sketch Card of the Day- Rokkon! Today's deviation is Rokkon! 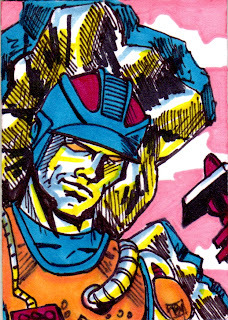 Rokkon is the hot headed heroic Rock person of the only two Rock People in the Masters of the Universe toy line. Wow...only two. I remember these guys when I was a kid. I always wanted the Rock people, but never got one till I was late in my youth (thirties). I was excited about these guys cause they turn, nay, TRANSFORM into rocks! Yes! They TRANSFORM into ROCKS! Normally I would say that my excitement is out of proportion due to the fact that these guys turn into... rocks. I couldn't think of a more boring object to turn into other than kitchen supplies. But then again, there's a lot you can do with kitchen gadgets. The most you can do with a rock is throw it, or plant moss on it. Oh, and roll it. But, the fact is that the idea of a transforming MOTU character was very enticing to the kids of my day. I do wonder how Mattel will deal with the Rock People in the Masters of the Universe Classics Line. I'm not sure that they should transform. Maybe they will outsource their character designs to Hasbro for them to make the Rock People into Transformers. My God, in some ways I can't believe I said that and no, Mattel will figure it out. You can also see this sketch card here.